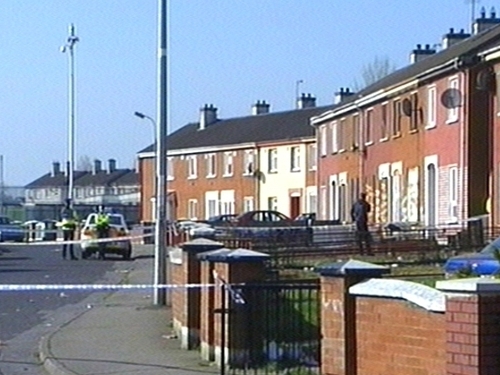 A murder investigation is under way after an 18-year-old man was stabbed to death at a house in Limerick this morning. Gardaí were called to a row at a house in Creavel Park in Moyross at around 2am. Darren Bennett, who was from the area, was found lying at the front of the house with a stab wound to his stomach. Gardaí believe he died after a fight broke out between members of a number of rival families in the area, but do not believe it was gang-related. Mr Bennett was taken to the Mid Western Regional Hospital in Dooradoyle but died shortly before 3am. The area where Mr Bennett was found remained sealed off today. State Pathologist Dr Marie Cassidy was called in to carry out a post mortem examination to establish exactly how the young man died. Two people were arrested at the scene early this morning in connection with public order offences. There has been considerable tension in the area today between opposing youths, and gardaí backed up by a number of regional armed support units were on duty to diffuse further violence.